Picking up literally from the closing events of the first film, Tony Stark - in a moment of sheer arrogance - has just revealed himself, to the world, as the mysterious armour-clad Iron Man. The news starts to spread rapidly, and eventually finds its way to Russia where Ivan Vanko plans his revenge on Tony for disgracing his family name. All typical comic book fluff so far. As you would expect Robert Downey Jr is, effortlessly, on top form for playing...err...Robert Downey Jr? Some people, understandably, find this quality in his acting a bit irritating and repetitive, personally I have always enjoyed it, offering light relief from the constant intensity found in his peers, in similar features, such as Christian Bale in Batman or Toby Maguire in Spider-man. He managed to capture the narcissism of Stark while also having the opportunity to touch upon his much documented alcoholism, a brilliantly bold move for a superhero, who is obviously a role model to children. Downey Jr was fortunately boosted by a frankly brilliant supporting cast, Mickey Rourke defied my expectations as the psychotic Whiplash - even producing a mildly acceptable Russian accent - while Sam Rockwell was entertaining as Tony's corporate adversary, Justin Hammer. Don Cheadle had one of the hardest tasks required for any actor having to step into the shoes of the departed Terrance Howard - who bowed out from returning due to contractual issues. Though he wasn't quite as charismatic as Howard in the role of Rhodey Rhodes he probably pulled off the 'All-American Solider' persona a bit better, coming off as a stern bad cop to Stark's laid-back slapstick good cop, not to mention was one of the highlights of the movie as War Machine. Though faring far better than I had initially expected, it was slightly disappointing not to see Scarlet Johansson's sultry Black Widow sport her original Russian accent - seriously if Mickey Rourke can just about get away with it, why not someone as capable as she?! One of the outstanding cameos that made me genuinely smile was not the brief appearance of a certain iconic shield, nor was it the return of Nick Fury (Samuel L Jackson) but seeing Mad Men's John Slattery appear in vintage video reels as Tony's father Howard. Similar to the first movie however I was underwhelmed the action element took a bit longer to fully bare fruit than perhaps it should for a sequel. However when you have a character like Tony Stark, you could probably go most of the film without seeing his near-indestructible alter ego and having few complaints. Where Iron Man 2 succeeded as a sequel was developing Tony Stark as a person, realising his own personal journey, into the hero everyone wants him to be, is far from complete. The film also is a treat because it must be the first sequel in a long while to not bother going down the 'darker is better' route, capturing the true spirit of Marvel Comics, in comparison to their DC counterparts. 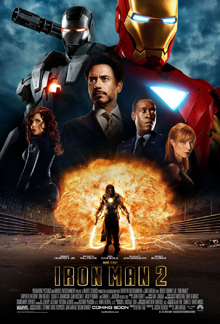 Iron Man 2 was a highly entertaining film that perhaps could have had a higher injection of mindless action to balance the troubling inner-demons of the protagonist. Overall I found it no better yet no worse than the first instalment which, considering how enjoyable the previous film was, is hardly a bad thing. Though as mentioned before, time after time, will the film makers at Marvel please consider better villains for their future productions.